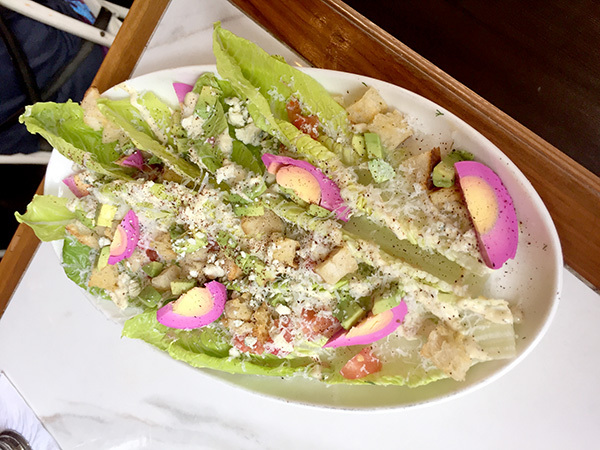 For those stuck on tacos, burgers, ramen and other hyped-to-death fare, Cafe 21’s poetically structured dishes will seem like the wheel was reinvented. It’s the kind of food that doesn’t jibe to any particular category and tastes as pretty as it looks. 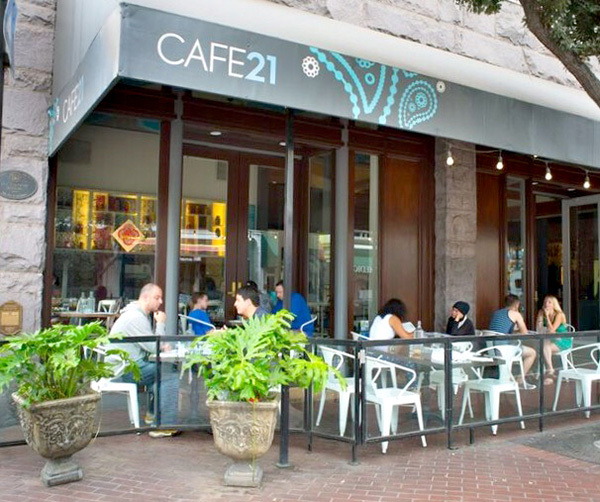 Alex and Leyla Javadov are the married couple from Azerbaijan who launched Cafe 21 nearly a decade ago in Normal Heights. They eventually branched to this second location in what used to be Croce’s Restaurant & Jazz Bar within the historic Keating Building. The triple-storefront space, with its interior brick walls and large bar area, is among the choicest and most visible chunks of commercial real estate in the Gaslamp Quarter. As a result, the place can get slammed at times. Leyla does the cooking. She’s a humble, self-taught culinary artist with a keen knack for making breads, pastries, and savory dishes brimming with the kind of complexity you’d expect from a highly schooled world-class chef. I’ve followed her cooking since the early days and savored with awe the synergy of multiple, unexpected ingredients she often puts into a single dish. 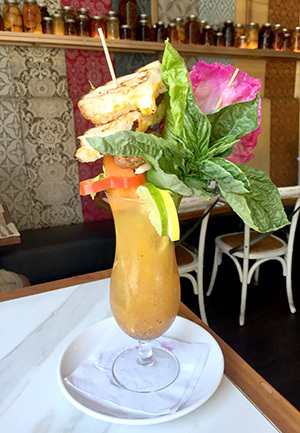 Everything is meticulously composed, including a yellow heirloom-tomato bloody mary that my companion couldn’t pass up — and rightfully so. 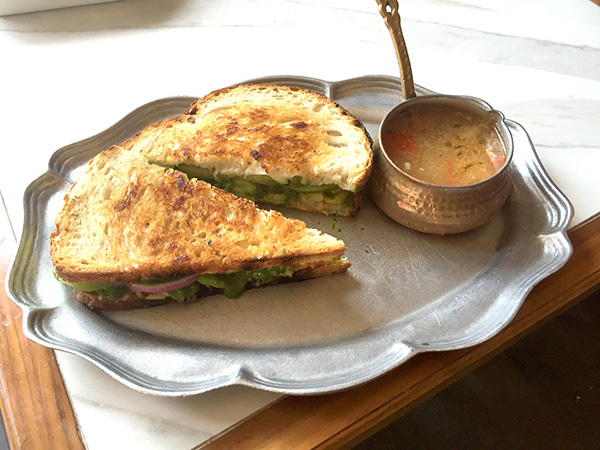 Spiked with a little horseradish, it bloomed with veggies, leafy herbs, edible flowers and a divided grilled cheese sandwich flaunting exceptional flavor and crunchy texture. Though showy, the sum of all parts constituted as a substantial meal course. Even something as prosaic as Caesar salad is a gustatory thrill. Where else are you going to find turmeric, cumin, grilled lemon and hard-boiled eggs with their whites tinted purple from beet juice in the medley? Anchovy aioli is the vehicle that sneaks in clever hints of the fish. Another salad, the French-inspired Olivier, was like chomping into a summer garden. Potatoes, peas, cucumbers, fresh dill, roasted carrots, and radishes of various types waltzed through a shallow pond of exotically spiced vinaigrette. My companion wondered initially if the ingredients in the bowl all would get along. In every forkful, they did. 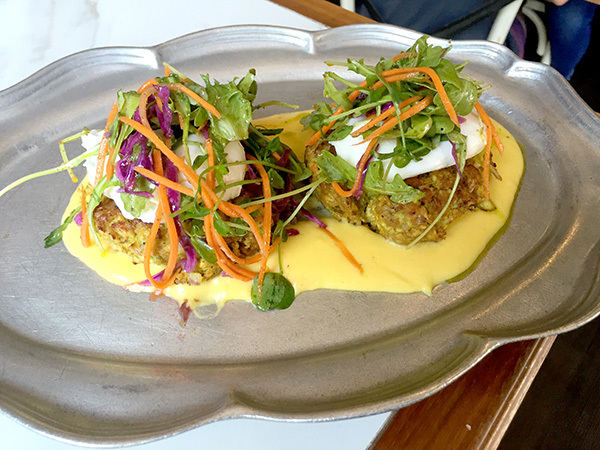 The cafe’s chicken curry cakes have been on the menu since the early days in Normal Heights. I was overdue to finally try them. Think Maryland crab cakes but with minced chicken kissed with semi-spicy yellow curry and speckled with celery and red onion. The bonus: poached eggs and bright-tasting hollandaise sauce drizzled on top. Served in a pair, they were top-notch. Shrimp and green pesto struck a cozy match between thick slices of toasted sourdough. Veggies, avocado and mozzarella added heft to the sandwich while superb chicken soup sat alongside in a pretty copper pot. Whatever the daily soup, get it. Leyla is a master at making them. Nearly every dish flaunts snipped herbs, worldly spices and crafty sauces that don’t repeat too often across the menu. The more adventurous your choice — such as eggs Benedict over turkey, cranberry jam and spinach-feta bread pudding — the better your chances of striking gold (I saw it whiz by and had to restrain from jabbing my fork into it). In glancing at the dinner menu, I’d eagerly sink my choppers into the Azeri-style ravioli with grass-fed beef and orange-kumquat reduction. Or the prosciutto-wrapped pork porterhouse cutlet stuffed with apple, blueberry and fontina cheese. Many of the choices bring together cooking styles of Eurasia and California in ways you won’t find elsewhere on the local dining scene. 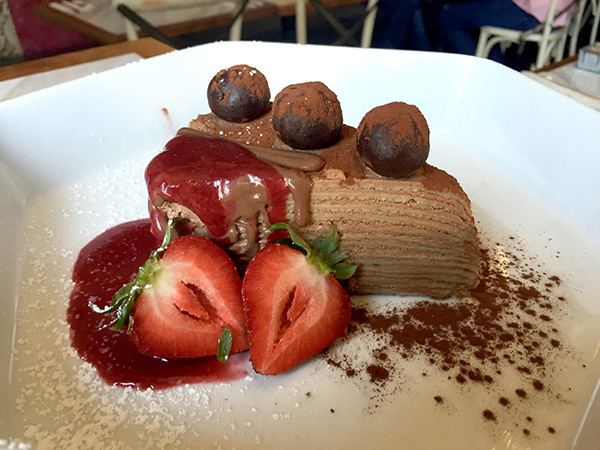 We ended with chocolate crepes rising upward to the height of a tall-standing slice of cake. I’ve never seen anything like it. Thin smears of semi-sweet chocolate cream occupied the many layers, which were meticulously stacked and fork-tender. Cocoa powder and truffles on top sealed the deal. Note: Customers can park in the Horton Plaza parking structure several hours for a flat fee of $8. 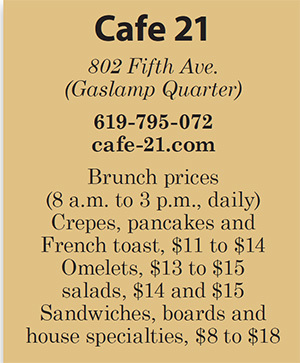 Be sure to ask a Cafe 21 server to validate your ticket.